Notes: Sheepscot Valley Chorus celebrates its 35th season with their Christmas concert Sunday, December 6, 3:00 p.m., at Boothbay Harbor Congregational Church. Featured on the program is the Vivaldi Gloria, performed with a professional chamber orchestra and featuring soprano Nina Tilander, with soprano Linda Blomquist and alto Sarah Highland. Composed in 1715, the beautifully sunny character of Vivaldi’s Gloria, with its varied and exciting themes, has given the work timeless universal appeal. Yet the piece was undiscovered for two centuries after the composer’s death, until it was found among others of his manuscripts in the late 1920s, finally restored to its original version in 1957 when it received its first modern day performance and leapt to popularity with performers and audiences alike. Soloists and orchestra also will join the Chorus for the second half, which includes John Rutter’s lyrical What Sweeter Music, Herbert Howells’ A Spotless Rose, featuring baritone Jim Crowley, works by Keith Francis, and traditional carols such as Winter Wonderland and I’ll Be Home for Christmas. 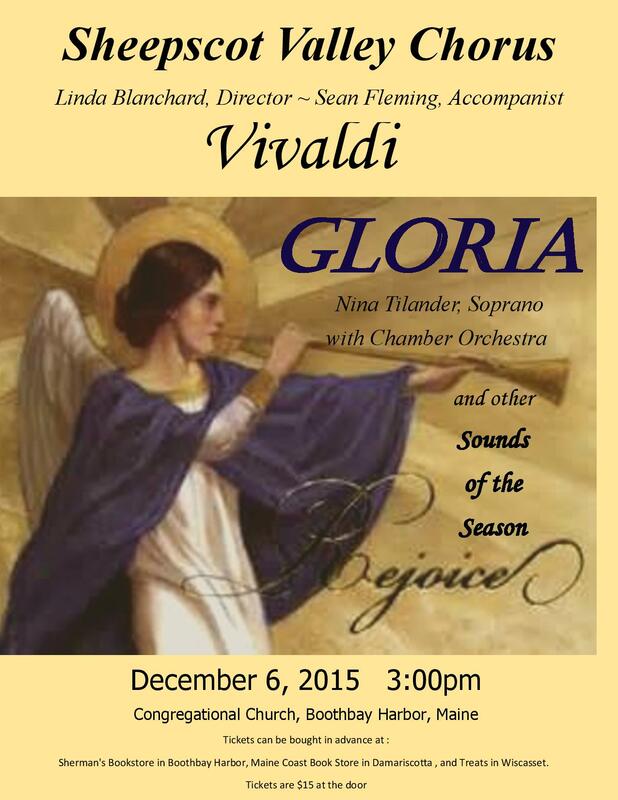 Sheepscot Chorus is lead by director Linda Blanchard and accompanist Sean Fleming, both of Damariscotta. Tickets may be purchased at Maine Coast Book Shop, Sherman’s Books, Treats, and at the door. Tickets are $15 for adults and free to students. For more information, please visit our website at sheepscotvalleychorus.org. Sheepscot Chorus will join with the Coastal Chorale and accompanist Richard Kinney to bring a second performance of this program (without orchestra) to New Harbor Methodist Church on Sunday, Dec. 13th, at 2:00 pm. This special performance commemorates the Coastal Chorale’s first concert thirty years ago, which also featured the Vivaldi Gloria under the baton of founding director Nat Weston, and is a gift to the community, with a free will offering.